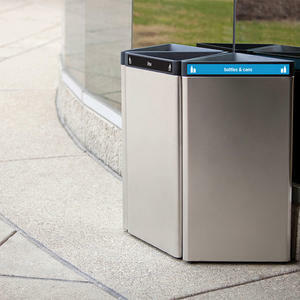 Forms+Surfaces’ Litter & Recycling Receptacles now feature improved graphics, thanks to help from our signage experts at Cornelius Signage, A Forms+Surfaces Company. 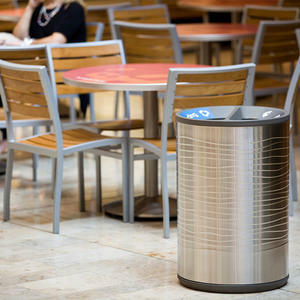 We had two goals when we set out: refresh the look of the graphics that identify each waste stream opening; and find a material that would be more durable than vinyl and adhere firmly without peeling. The first was readily accomplished. 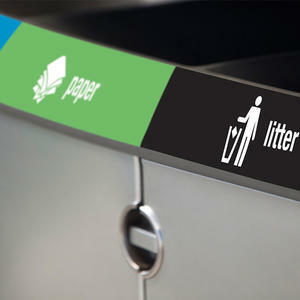 New lettering chosen for its clarity now accompanies updated symbols for typical waste streams: litter, recycling, bottles & cans, paper, and compost. The second was a bit more challenging. But after numerous trials we came up with a solution. Drawing on Cornelius’ many material advances, our new graphics are made of back-printed polycarbonate, a big improvement over standard vinyl solutions. Each graphic is a single unit comprised of white letters and symbols on a colored background, all printed on the back of clear polycarbonate. 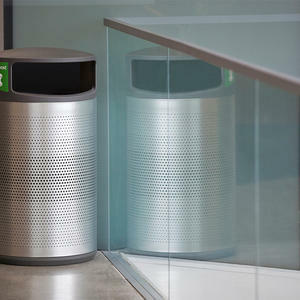 When the graphic is adhered to the receptacle, the back-printed message is protected, making it hard to damage and easy to clean. Unlike individual vinyl elements, the larger overall shapes of our new graphics have fewer edges and more surface area for bonding – significant advantages that reduce peeling. Finally, leveraging another Cornelius success story, the new graphics adhere to our receptacles with a high-bond adhesive that Cornelius has been using for more than 20 years. 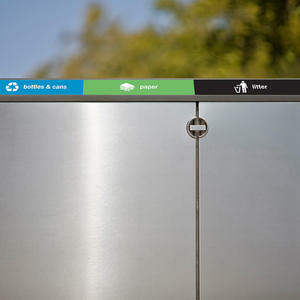 The results add up to durable receptacle graphics with a clean, contemporary look. 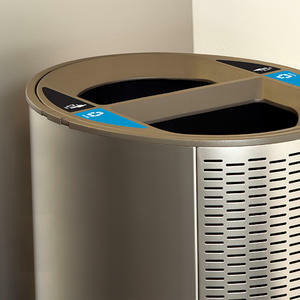 Visit the Litter & Recycling Receptacle section on our website to learn more, and find detailed information on our Product Data Sheets. Questions? Contact us.